I requested a digital arc of Voices from NetGalley. I was thrilled to see the approval for this one in my inbox because I have long held a fascination for Joan of Arc. Back in middle school, I did a big research project about her, and I just fell in love with her moving and tragic story. I am pleased to say that this book brought back a lot of the feelings I had when researching her life. So many of the voices in this book have amazing stories to tell. Her clothing, her weaponry, and of course the people in Joan’s life all get to share a part of their story through various forms of poetry. Even the flames that ultimately end her life get a say in this beautifully composed collection of thoughts. One of the most compelling things about Voices is the snippets of trials where Joan was prosecuted. It was so enlightening to read those historic words alongside the speculative poetry. It all felt more real in light of the thoughts presented during Joan’s trials. I could have read 100 more pages of similar accounts and thoughts. Joan of Arc’s life is full of so much real life magic and mystery. Her story is presented by David Elliott in a supremely respectful and insightful manner. I really can’t say enough good things about this book. It made me want to revisit more information about her life and the events that led to her death. It’s so tragic that some of the same prejudices still face women today. Reading about Joan’s bravery in the face of such severe adversity can only be an inspiration to anyone who feels oppressed. 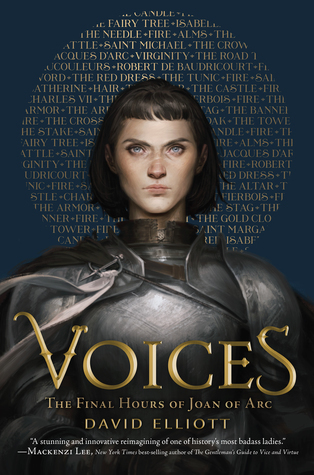 Voices will be in bookstores on March 26th. I’m so glad you liked this one it was just so original to me and so well done. I really did! It was just a joy to be immersed in Joan’s story again.